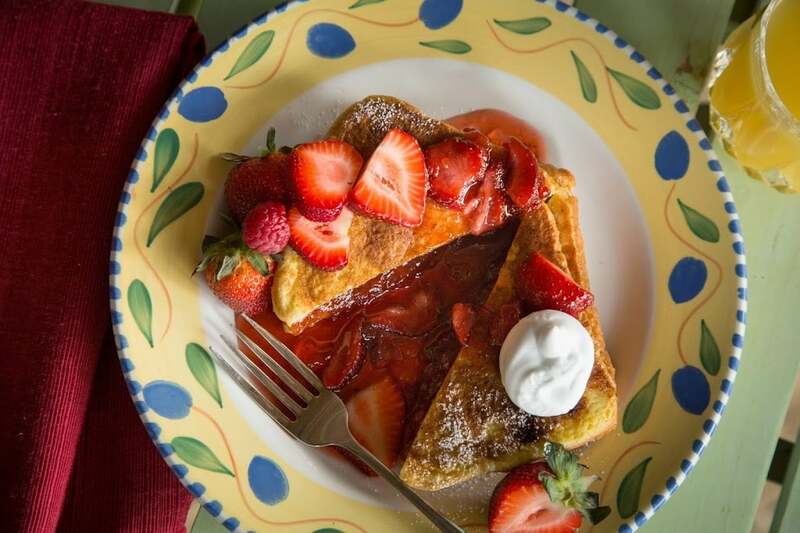 Guests have been asking for my French toast with strawberry sauce recipe, so while strawberries are in season, I thought I should share. This is a great recipe to prepare the night before – especially if you are serving breakfast to a large group (makes 10 servings). Arrange half of bread in a lightly greased 13 X 9 inch pan. Sprinkle with cheese pieces and top with remaining bread. Whisk together eggs, half-and-half, butter, and maple syrup; pour over bread mixture, pressing bread cubes to absorb egg mixture. Cover and chill 8 hours or overnight. Bake, covered, at 350 degrees F for 25 minutes. Uncover and bake 20 more minutes. Heat sliced strawberries and strawberry preserves in a saucepan over low heat, and serve over toast. You can easily adapt the sauce and use any fruit that’s in season, such as blueberries or raspberries – just use your imagination! You can also serve a variation of this recipe for just two people. Take 4 slices of Texas toast, and dip in a batter of eggs & milk. Toast one side of each slice on a griddle, then spread cream cheese on each toasted side. Put two cream cheese sides together, and toast the other sides of the “sandwich”. Then serve with the strawberry sauce. There is one final way to enjoy this recipe, which we highly recommend. Spend the night with us and we’ll serve you Breakfast at Tiffany’s! No preparation, no cleanup, just sweet enjoyment!